As of this posting, Queen Elizabeth's Facebook page currently has 180,830 fans. The combined UK and Commonwealth states population is over 195 million. Update: The original version of this post featured an unfortunate fan page. 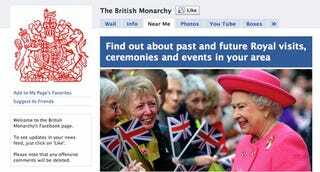 Changes now reflect the Royal We's official page. Apologies to the royal subject whose loyalty does not fade.